Some news that came to us via the Grande Dame of blogging, La Cieca, at Parterre Box: It would appear that an operatic power couple -of sorts- has been married in Amsterdam. Ira Siff, teacher, coach, director, Opera News writer and very close 'friend' to Madame Vera Galupe-Borszkh has married his partner, opera singer Hans Pieter Heijnis. 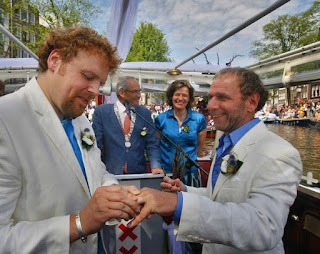 The ceremony, which took place August 1st on an official wedding boat during the Gay Pride Canal Parade in Amsterdam, was performed by Amsterdam's Mayor Job Cohen. Cohen married five American-Dutch gay couples on Saturday as a challenge to New York where a battle over the legalization of gay marriage rages on. All five couples had at least one partner from New York. According to Reuters, Ira Siff said: "For me it's a message to New York, the most liberal state, the most hip state, to get with it." New York state law does seem a little backward because although gay marriage is not legal under New York state law if it is performed here, the state does recognize gay marriages consecrated elsewhere where it is legal. So, at least the couples wed on Saturday have this: they will be treated as married by the state of New York. Now, it is time for New York to allow gay marriage to be legalized instead of forcing it's residents to go elsewhere to be married. PS, FYI, and sidenote: In no way, shape or form does gay marriage have a negative affect on my marriage or its sanctity. Allowing a gay couple to marry doesn't make my marriage mean less, nor does it make it null and void... if anything, gay marriage would help to show that the sanctity of marriage has no boundaries. If you'd like to debate this based on what the Bible says should be a union between a man and woman -fine- let the church decide whether or not they will perform marriage ceremonies for gay couples, not the law. Federal and state laws are considered the "law of the land" not the "law of the church". If a heterosexual couple is married by a secular officiant and they are counted as lawfully married, then a gay couple married by a secular officiant should also be counted as lawfully married. Get it? It's LAWFULLY married - not CHURCHFULLY married. After all, the last time I checked, there was this pesky little thing called "the separation of church and state". The church and its talk of a union between a man and woman should be taken out of this legislative debate. For those who hide behind the sanctity of marriage argument - I say that the sanctity of marriage isn't some box into which only certain marriages can or should be placed. At its foundation, the word sanctity means: a sacred thing. Love is sacred. Commitment is sacred. Marriage is sacred. Let's allow gay couples to show that what they have is a just as sacred as what I have with Jenn? Gay couples are not asking to be married in a church... they're asking for the same benefits and preferences that lawfully married heterosexual people receive because their love and commitment should not be considered as "less than". If they truly love one another and want to enter that level of commitment, let them. Finally, I send a hearty congratulations to all of the newlyweds - but, especially to Ira Siff and his new husband Hans Pieter Heijnis. I hope, if they have a reception here in the states, that Madame Vera will attend. Please, oh please?!? !